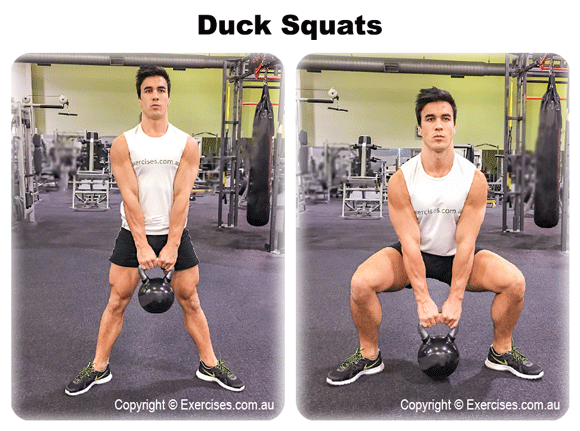 Duck Squats are an exercise that builds the quadriceps with primary emphasis on the adductors and the hips. The gluteus and hamstring muscles are also targeted by this exercise. You have to stabilise the core muscles by pulling your rib cage toward your lower abdominals. This will produce a contraction that will support your lower back and help maintain a slightly angled position. Duck Squats are an excellent exercise to build flexibility, mobility and stability in your hips and quadriceps. This is especially valuable for sports which demand great adductor and hip flexibility such as tennis, martial arts, football, soccer, rugby and basketball. Stand over a light to moderately heavy kettlebell. Assume a wider than shoulder stance; keep your toes slightly angled out. Keep your core tight, inhale and descend to the bottom position by bending at the hips and flexing the knees. Maintain a flat back position. Grab the kettlebell handle with both hands; exhale then squat up by pushing down the floor with your feet. Extend your knees then hips and maintain your arms in a straight position. At the top, inhale then begin the descent. When the crease of your hip is lower than the crease of your knee, then you have reached the bottom position. Exhale then squat back up by pushing off the floor with your feet and extending the knees then the hip. You can do Duck Squats without weights. 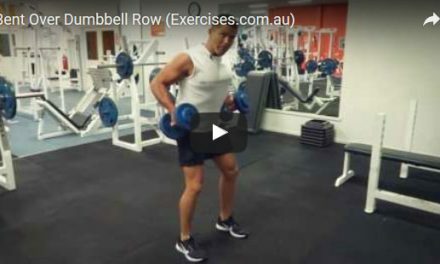 To add forward resistance, simply extend both arms straight out at shoulder level and proceed with the regular squat movement. With Duck Squats it is important to use a stance that is wider than shoulder level because at the bottom position you want to feel a slight stretch on the adductor muscle which is located in your inner thigh. Maintain a flat back and a slight forward angle. Make sure your knee does not go over your toes.